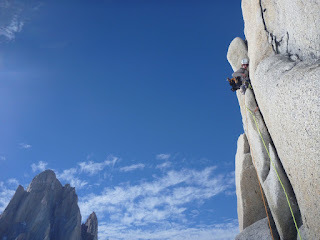 Excellent granite on Pitch 4! 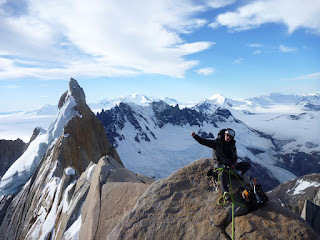 Jim el la cumbre primera! 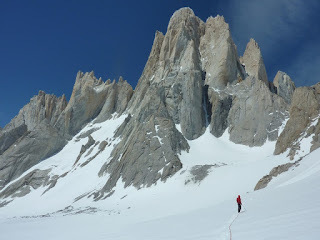 The early hours of 2011 brought splitter weather to the Fitz Roy Massif of Argentine Patagonia! 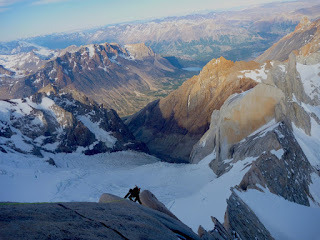 Two days of high pressure, low winds, and extremely warm temperatures sent all the climbers in El Chalten to the hills. 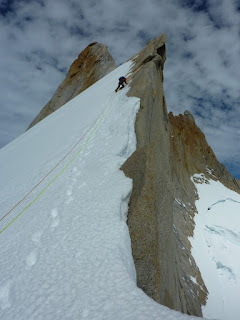 Jim Toman and myself had many ideas, us usual, where to go climbing. We were psyched to climb Fitz Roy via the Afanasieff Ridge, however, an insecure forecast and rumors of at least three other teams thinking about the route pushed us to find new terrain. 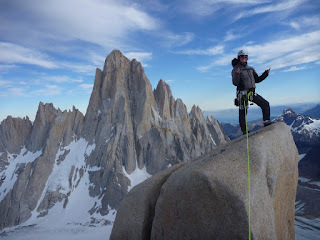 And we were rewarded on Cerro Pollone, a giant two-summited peak west of Fitz Roy. We awoke from a short nap at Piedra Negra basecamp to Wolfmother blasting the speakers and Fruitigrans, breakfast for alpine champs! We picked up our gear cache at Paso Cuadrado and descended by headlamp to the Fitz Roy North Glacier. The stars were out and a sliver moon illuminated the gnarled terrain of a landscape deep in the throes of change. 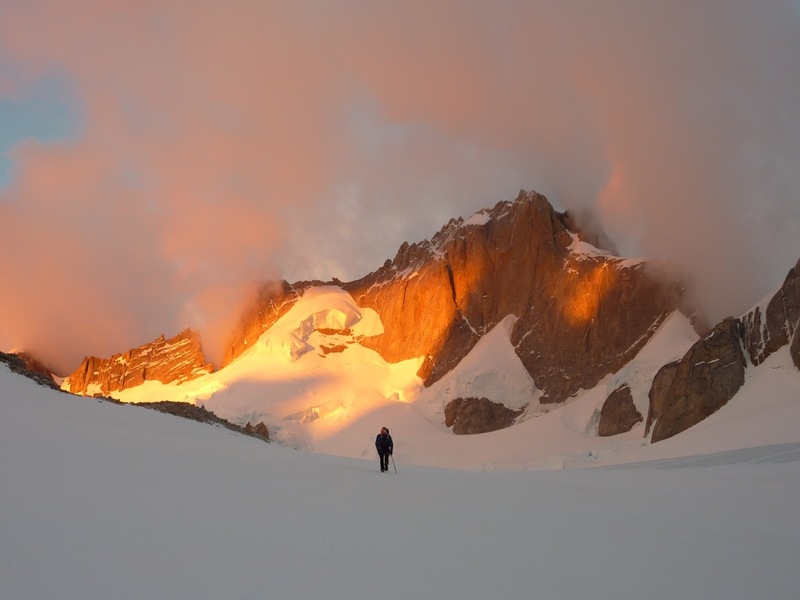 Picking our way through the jumbled ice and rock, our massive objective began to show through the dawn. 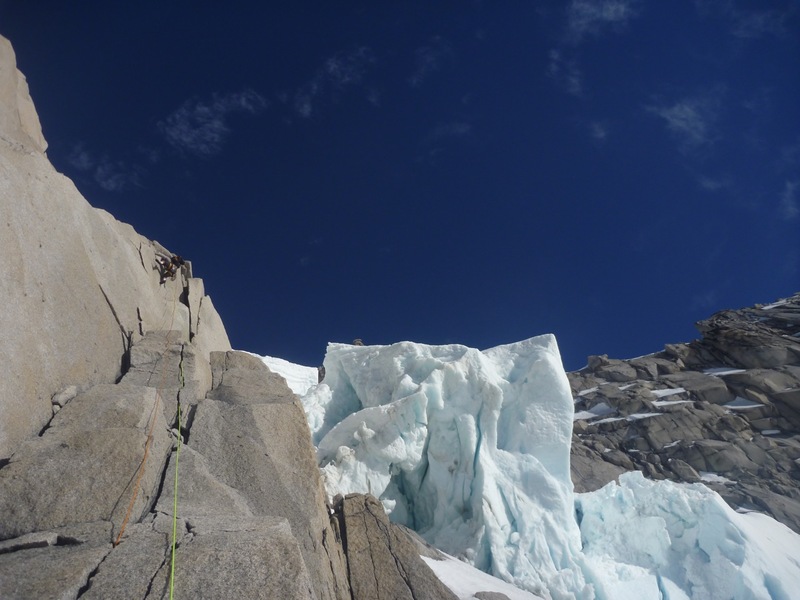 The first rock buttress is threatened on both sides by intimidating hanging seracs, and our line elegantly weaved through the danger zone, mas o menos! 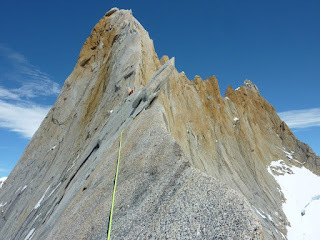 My lead block started with a wet chossy moss crack, which left me cursing and a bit scared! Pitch 2 threw some nice gritty granite crack and a physical chimney that felt a full grade harder with our "alpine packs", toting a full ice kit, armed to the teeth for whatever we found! Pitch 3 was a beauty! 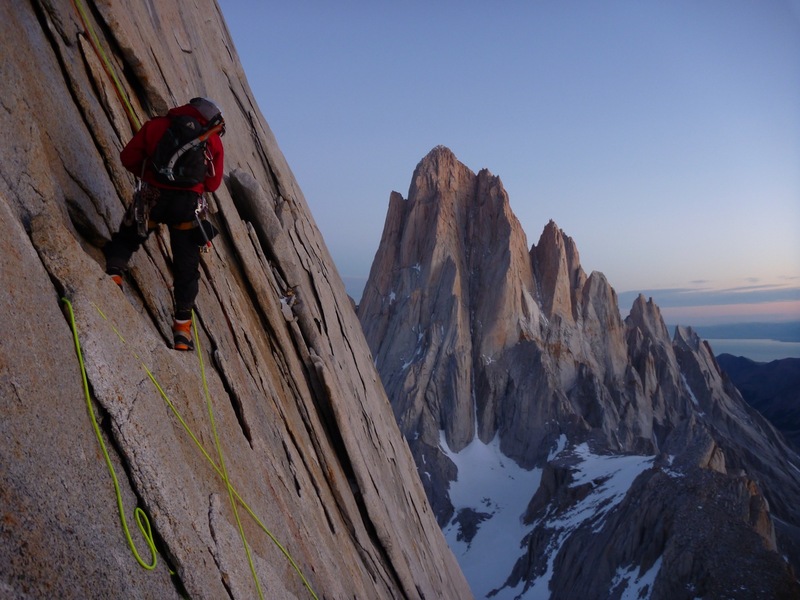 Those cracks that turn dreams to reality; we are in Patagonia sending a new route!!! Highlighting the 4th pitch in our minds, more quality stone and an exposed 10 meter hand traverse! 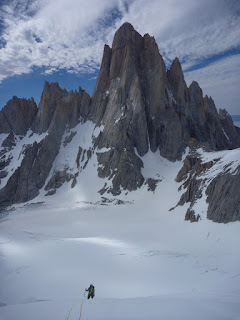 5 and 6 were a bit loose and gritty, but they got us to the snowfield, where we transitioned to boots, crampons, and tools for 200m of simul-climbing moderate terrain. 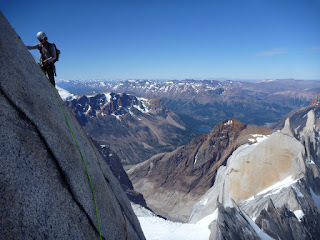 At this point we had reached the upper ridge, it was about 11am, and psyche was high! I handed over the rack to Jim and he led directly off an exposed hanging belay on delicate mixed terrain, pitch 7. 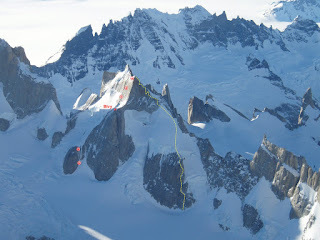 The ridge here is incredible! On our side, steep snow and rock; peering over the other side, the mountain immediately dropped hundreds of meters to another glacier, totally overhanging! After some great ridge romping, we stopped to melt water and eat some sugar. Our bodies were feeling worked from hard exertion in the intense southern sun, very little water or food, and mental strain. We found hardly any free water on the entire route, which we were expecting to keep us hydrated through our alpine straws. 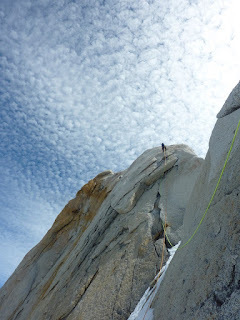 The next two pitches were the route's most difficult passages. After a beautiful hand and fingers crack, the wall completely slabbed out. Options here? Punch it up the slab! Yeah right. The feelings of doubt and disaster were close in our heads, but you gotta keep it together in these spots! Instead Jim pounded a pin and made a pendulum left into another system. 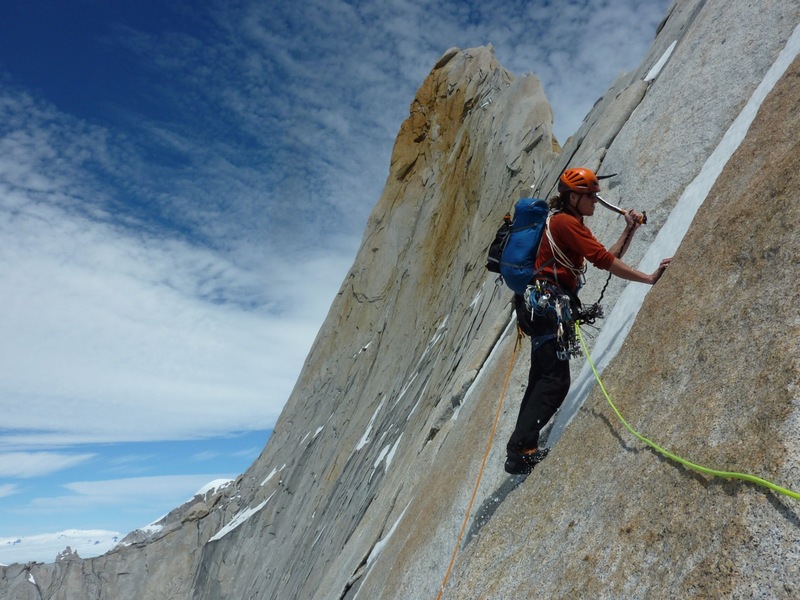 The next system was gritty and wet, it went down at A1, and probably would be 5.11 free. Once again I was feeling totally buggered at this long belay. My only savior was suckling the last drops of my MSR Dromedary and savoring a delicious Ricola!! 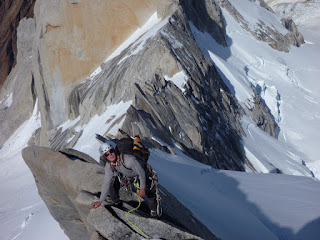 We found more snow and fired up the Jet-boil to stoke the psyche again. The next pitch was stimulating, traversing below the ridge on exposed 5.10 crack and face climbing, capped by a strenuous offwidth leaving me nearly puking! Pitch 11 needed aid again right off the belay, mostly due to extreme fatigue. The terrain relented a bit, then a memorable short slab was the final obstacle to the cumbre! We stood just below the highest point of a totally unclimbed summit! "Have at it Jimmy, that was a sick lead block and you earned it!" 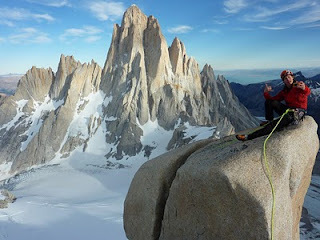 FIRST ASCENT!!!! It was around 8pm and the light was beginning to get really magical. The views were surreal and the moment even more so. To the west, the entire Fitz Roy group in all its splendor; a little to the south, the Torres, with Cerro Torre totally dominating the scene. 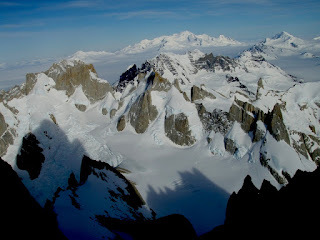 We could see the castle of Cerro Murallon way south on the icefield. Vast expanses of white and blue ice, mountains of dark black rock, and winding glacial paths twisting to oblivion. 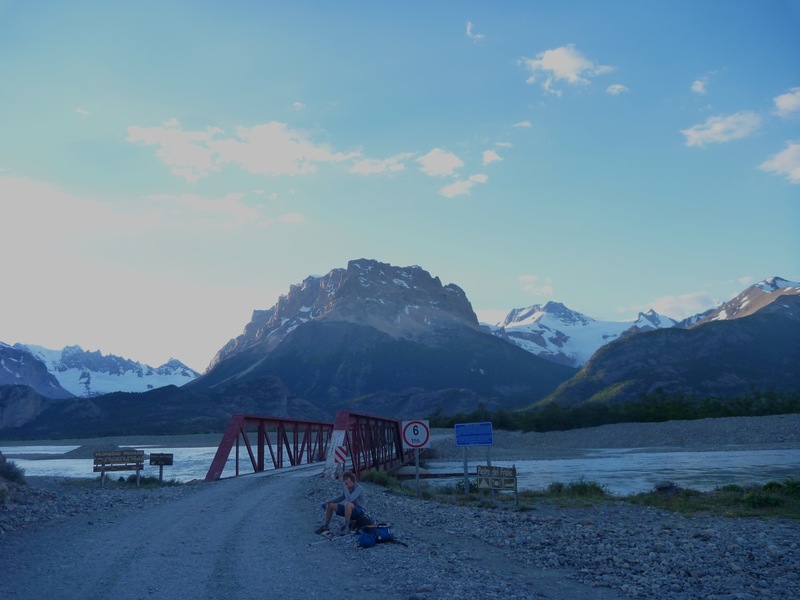 To the north, the vibrant green beech forests, deep blue lakes, and dry brown pampas of Argentina, rage on against the cold desolation of the Hielo Continental. The hour was late and it was definitely time to get off this mountain. 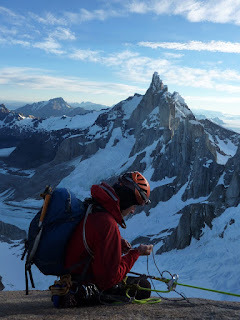 We made three double-rope rappels down the east face and found a nice protected bivy for the night. Darkness had made the rest of the descent treacherous without knowing our path. 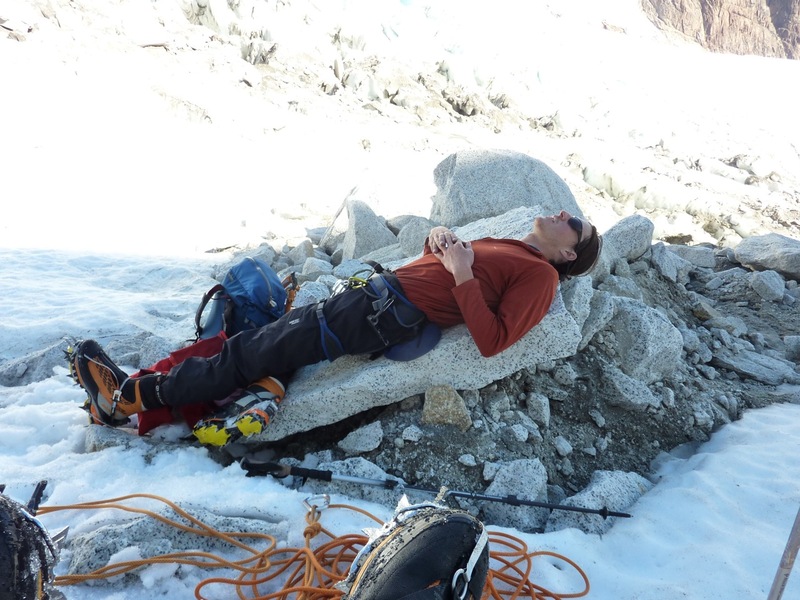 Jim and I contorted into his "one-man" bivy sack and cuddled the short night away. The dawn came and we slowly shook ourselves into consciousness, feeling wary and quite stiff. I felt like I couldn't eat another piece of sugar, my stomach was totally churned, and my head felt wrecked. Everything seemed to take way too much effort and we were feeling cranky and irritable. The descent opened up nicely and a few more easy rappels and downclimbing on snow brought us back the start of the mountain. WHOA! 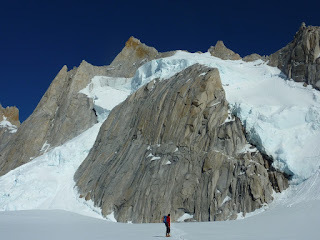 The rest of Sunday, January 2, 2011 was spent stumbling back across the radio-active glacier, mumbling about bife, re-applying SPF 110 sunscreen, and frying our brains to a nice crisp. The trudge back up Paso Cuadrado was blurry and tiring. By the time we reached the tent at Piedra Negra, Jim was brutalized, I was a total space-case, and we were both fully amped on the route and tripping out. This state of mind is rare. As I drank water and made some soup, I would close my eyes and immediately start dreaming vividly. There was no time lapse between "awake" and dreaming. After a few hours of this, we packed it up and hiked down. 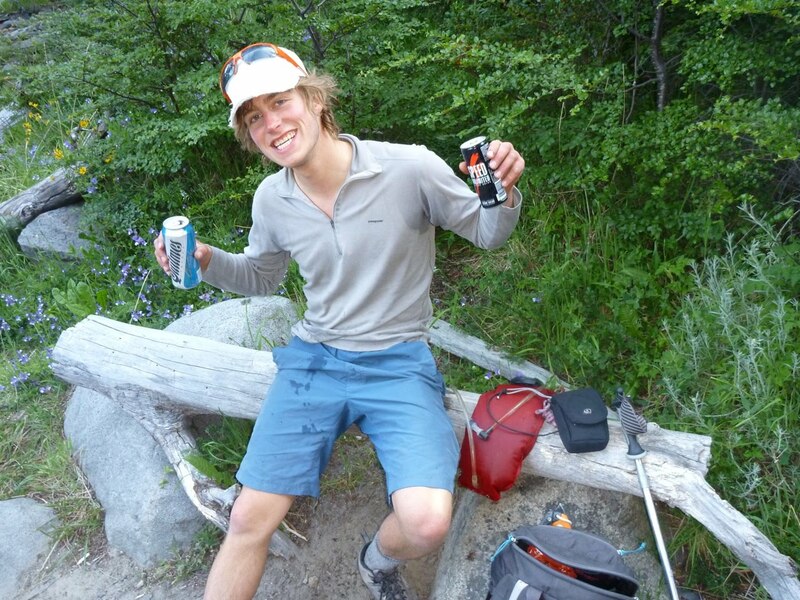 Strategically cached along the trail back to town, we found our Speed Unlimited energy drinks and Quilmes cerveza. I'm not sure we would have made it without these tasty beverages to fuel the fire.